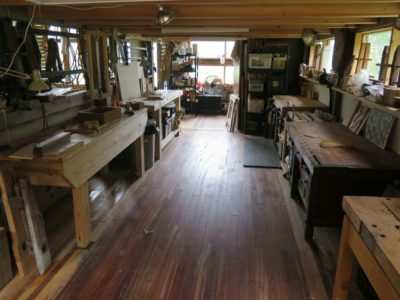 In my preparations for the workshop this weekend I decided to switch two heavy workbenches, moving the 8-foot Nicholson from my studio over to the classroom (shown here in its new location in the lower left of the frame), swapping it for the 5-foot Roubo in the latter. Since the lighter of these was over 200 pounds and I was doing all the work by myself I turned to my trusty sofa sliders from the hardware store. Slipping them under the feet allowed me to push the benches across the barn to their new locations with very little effort. 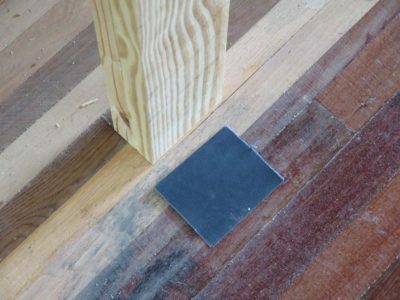 On the other hand the new location for the Nicholson is a little problematic in that the wood floor is a bit slick there, and with a very little effort working at the bench it would start scooting across the floor. So I needed to quickly make some non-skid slippers. I started with two sheets of 80-grit emory cloth, and tore them in half. 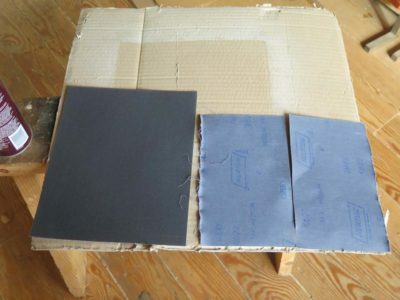 I sprayed the back sides with adhesive, then folded them together so that each face was the abrasive side. 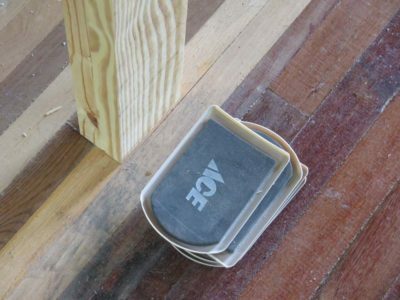 Then I slid a folded pad under each foot, and the problem of the sliding workbench was cured. 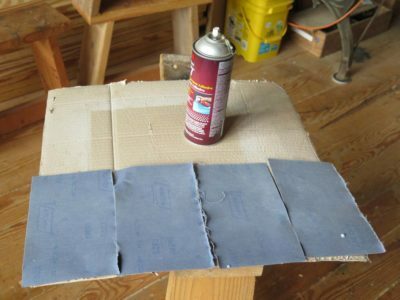 Two sheets of sandpaper, spray adhesive, 90 seconds. Done.